Many concerned Californians felt very let down when the establishment shills inside the California Democratic Party-- the Gavin Newsom wing basically-- backed away from holding reactionary New Dem Ami Bera accountable at the recent state convention by ending the short-lived withholding on the Democratic Party endorsement. As Thomas Frank explained Friday on Thom Hartmann's program and in his new book, Listen Liberal-- What Ever Happened To The Party of the People, the DC Democratic Party establishment power structure has made the very conscious decision to kick working men and women to the curb and replace their prioritization with the professional class (AKA, the top 10%). Gavin Newsom is very much a part of that wing of the new post-working class democratic Party-- as is Ami Bera, the right-of-center New Dem congressman from a swing district in the Sacramento suburbs. Bera has no primary opponent so, when the state Democratic Party gave him a little slap on the wrist for his serial betrayals, both the Teamsters Union and the Carpenters Union endorsed Sacramento County Sheriff Scott Jones, the Republican in the race. In the 1970s, 100,000 Teamsters found their way to the middle class by working in California canneries. Now, the number of union cannery workers sits at 15,000. Doug Bloch, political director of the Teamsters Joint Council 7 in Northern California and Nevada, blames much of the job loss on the North America Free Trade Agreement. 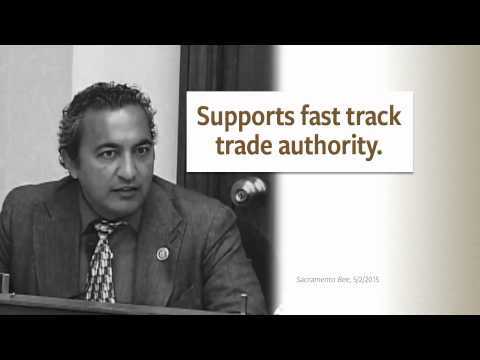 Rep. Ami Bera, the Elk Grove Democrat seeking a third term in what will be a close race, is feeling labor’s burning anger, after breaking with unions and voting to give President Barack Obama fast-track authority to negotiate the Trans-Pacific Partnership free-trade deal. Last week, Joint Council 7 took the extraordinary step of endorsing Bera’s Republican foe, Sacramento County Sheriff Scott Jones. Bloch cannot remember the last time the Teamsters endorsed a Republican in a contested congressional race. The Communications Workers of America and the biggest national nurses union each endorsed progressive Democrat Tim Canova against right-of-center, anti-working family shill and much-distrusted DNC chair Debbie Wasserman Schultz in her south Florida, deep blue district. And a few days ago the Working Families Party of Oregon endorsed progressive Democrat Dave McTeague against chief Blue Dog, one of the worst Democrats practically living across the aisle with the GOP in Congress. The DCCC surprises primaries, so what choice do working families have other than to back a Republican, even if it's a worse Republican? 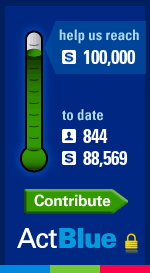 The way the DCCC has participated in that change from being the party of the legitimate aspirations of the working class to the party of Wall Street, multinational corporations and the Top 10%, has been to reject working class candidates for self-funding wealthy Republican-lite candidates-- sometimes actual Republicans willing to switch their party registrations, the way conservatives Tim Mahoney and Patrick Murphy have in Florida, the way conservative Filemon Vela did in Florida, the way conservative Mike Derrick did in New York and conservative Mike Parrish did in Pennsylvania... a small handful of examples. Sunday, Bill Turque did a story on multimillionaire alcoholic beverage purveyor David Trone and his bid to buy a Maryland congressional seat. Trump has reinvigorated the spirit of rich conservatives seeking offices to buy. A few days ago we saw how Vincente Gonzalez wrote himself a million dollar check to try to do exactly that in South Texas. Trone looks to be spending 10 times what Gonzalez has spent! He has hired top-of-the-line consultants, launched a major television and radio ad blitz, and is landing glossy multi-page mailings on the doorsteps of likely primary voters almost daily. ...Little known in the district less than two months ago, Trone now appears competitive with the two front-runners: Jamie Raskin, a liberal law professor and state senator, and Kathleen Matthews, a former television anchor and Marriott executive who says she is willing to dip into her own fortune, if necessary, to keep up. ...The willingness of candidates such as Trone to pay their own way raises questions about whether they are undermining a foundational idea in U.S. politics-- that those who want to represent the people must first earn enough of their trust to win their donations. And it is an uphill path; between 2002 and 2014, House candidates who spent at least $1 million of their own money won office only 20 percent of the time. Trone says taking money from others makes politicians vulnerable to pressure from lobbyists, PACs and other special interests. A graduate of the Wharton School of the University of Pennsylvania, he says it’s also a matter of time management, noting that members of Congress spend up to half of their time raising funds. ...That approach could resonate with voters in this unusually angry campaign season, in which Republican mogul Donald Trump has elevated the can’t-be-bought narrative into a dominant theme of his self-funded run for president. Right now, a substantial piece of her campaign is being financed by MSNBC through her husband's TV show, Hardball where tens of thousands of dollars from guests of the show make their way into her campaign coffers. MSNBC denies they are breaking any laws. Back to Thomas Frank's book for a moment-- apparently black voters have given the Clintons what they need and are no longer the priority they were in South Carolina, Georgia, Mississippi, Texas, etc. This week Bill continued pivoting to the right by throwing Obama and his policies under the bus: "But if you believe we can all rise together, if you believe we’ve finally come to the point where we can put the awful legacy of the last eight years behind us and the seven years before that when we were practicing trickle-down economics and no regulation in Washington, which is what caused the crash, then you should vote for her." Imagine if Bill or Hill had used that as part of a stump speech in the Southern state primaries!